Issue: Employee Maintenance form contains SUTA State field, which is not available for other Region Installations (for instance, UK and Ireland Region). Since it is not available on the form, the users does not have any idea about this and don’t enter any value. By default, this will store a NULL string (EDIT [04/21/2009]: It’s not NULL String, it’s an EMPTY String denoted as “”. Read the comment from David for more details.). When we try to run Payroll Check, this field will be referred and an error message will be popped up. Now, the catch is: Even if we modify this form using Modifier and make this field visible, we still won’t be seeing this field on screen. Reason: When the Employee Maintenance form is opened, either the Window PRE or Form PRE script (or BOTH) would be triggered. And from any one, a validation checking the Region would be conducted. Based on that, the respective fields will be either shown or hidden. Since this user’s GP installation is “UK and Ireland” and they don’t have SUTA State, this field would be hidden thru’ code. This will override our Modifier changes. Solution: A typical and simple VBA / Continuum / Sanscript code would solve this. 1. 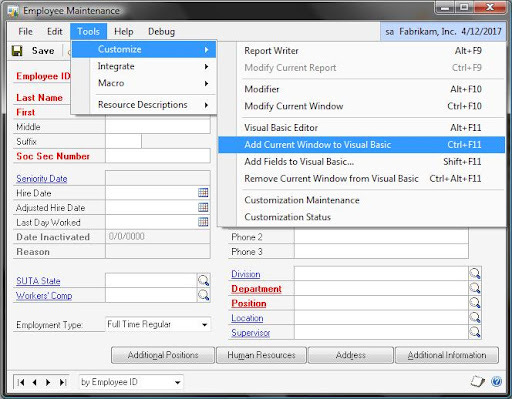 Open the Employee Maintenance form and add this form to VBA Editor and open the VBA Editor. 2. 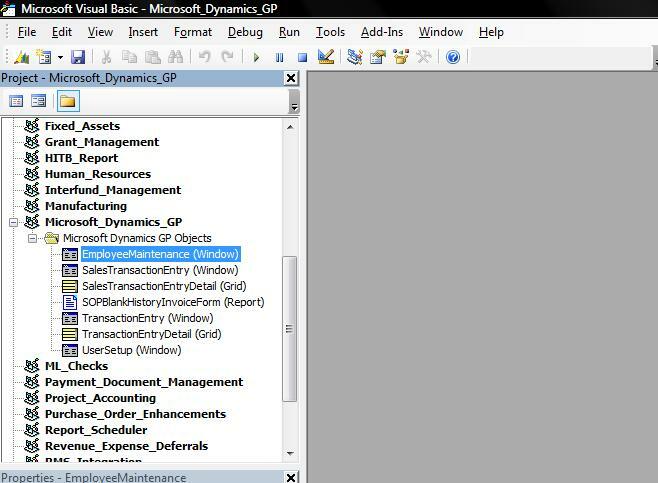 From the left hand side tree view, select the “EmployeeMaintenance” from “Microsoft Dynamics GP”, if the form is of original GP. We have several products customizing this form, including HR and Project Accounting. Depending on that, we should select “EmployeeMaintenance” from under the respective product name. 3. Write the code shown below (click on the picture to see it on full zoom). 4. Save this VBA project and compile it to see any error message you get. Rectify, if any error found. We are good to go now. Simple, but very efficient. 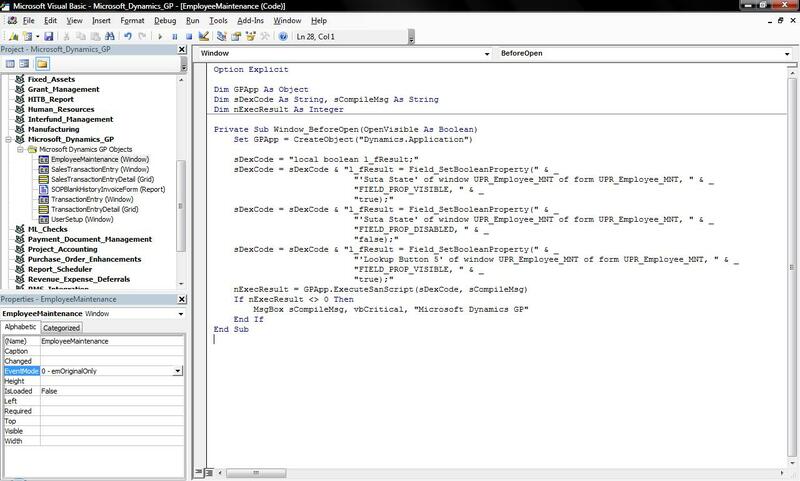 You can find a sample package of this customization from the link: VBA & Continuum – Making an Invisible Field Visible. This package will work only on Microsoft GP 10.0 and for Regions other than United States. Try this package on, for instance, United Kingdom & Ireland to see the results. Do get back with your comments / feedback.